Between v392 and v435, Obsidian has removed the 2D textures and sounds from the external assetbundles that we use for modding. We assume that this was done to optimize memory usage. However, the external assetbundles for items and spells are not used by the game by default, and are not loaded into the memory unless the game is told to use those files explicitly. They are duplicates containing most of the necessary files. In previous BB versions, the assetbundles contained almost everything one would need to mod. We only had to export Obsidian's custom shaders and assign them to items and spells. Now, all of the item and spell files are also missing 2D textures and sounds. This effectively takes away our ability to mod, or at least in order to mod, it would take us weeks to repair the damage done to the assetbundle files by this change. We (Bester and I) are not sure if this was done deliberately to optimize memory or fix a problem, or if it was an unintentional side effect of said optimizations, but we have poured many hours into learning how to mod this game so far, and such a setback is both frustrating and demoralizing. We ask that if possible, that this be rectified by release. Edited by Sensuki, 06 March 2015 - 09:51 PM. I don't understand why Obsidian would do this. Externalizing them has no effect on people who don't use mods and gives modders a huge helping hand. I mean honestly, us KS backers should have demanded open source, but taking this away feels like a kick in the crotch. Right now, I doubt Obsidian's highest priority is bringing back modding support for a handful of people. The backer beta wasn't intended to be modded. It was intended for software testing. Changes to the backer beta reflect changes to the full game. It's got nothing to do with trying to suppress modding in the backer beta. If they wanted to do that they'd obfuscate their code. Obsidian, please externalise as many assets to the game as possible upon release . Could also be for the same reason as to why Adam Brennecke asked those who are modding to not post full game pictures on the backer beta forums (as it affects google image search) or upload items/pictures from it. It's awesome that you and Bester are learning to mod the game more and more, and chances are that a lot more files will be found (and all of the code/strings/assets might make a little bit more sense, more consistency and more stability) that neither of you two might have a vague idea about until the game is released. How much content is there Backer Beta in comparison to everything in the full game? 1/40th? 1/20th? 1/10th? Half? Isn't it common for optimization to also cause comprimised file size? (Zealous focus asset going from 1,148 mbs into 148 kbs, 1 mb. Looks like optimization to me). Edited by Osvir, 06 March 2015 - 11:42 PM. For the third time (once stated in the OP, and once above) it was not done to suppress modding. If they wanted to suppress modding - they would obfuscate the game code as it's the game code that allows us to make mods, and allows us to make a Unity Editor to make mods that modify assets (as we need the source code to understand the assets). The reason the file size is smaller is it's because they removed files from the assetbundle, that were required for it to function. Do you really care if your game folder is 100mb smaller? I doubt it. 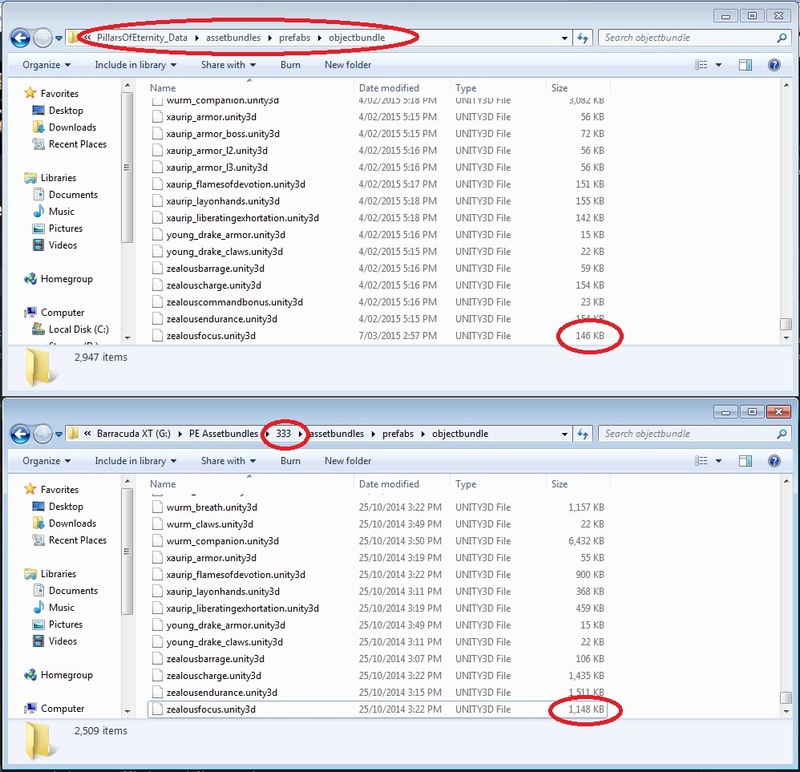 These files are not loaded into the game's memory unless you type in a console command to load the assetbundles. It was most likely an unintended side-effect of optimizing the game's size on disk or a mistake made when optimizing memory usage. Now that we have discovered the issue and made Obsidian aware of it, it is up to them to decide what to do. We have stated our preference - add the files back in at some point. Edited by Sensuki, 07 March 2015 - 12:00 AM. But I didn't mean to "suppress" modding, but rather suppress a risk of unwanted exposure. My thought/question was and is: Maybe those files will be in there at release or sometime after release? And also, now that you know most about modding for Pillars of Eternity, wouldn't it be possible to do some hobbyist pre-production (and wouldn't this be the best time to do it?) of what you want to achieve through mods? Edited by Osvir, 07 March 2015 - 12:14 AM. I don't know the most about modding Pillars of Eternity, Bester does. My time is best spent on reporting bugs. I was a bit disappointed that a new patch was not released before the weekend because I didn't have anything on this weekend - so we've been doing some modding investigation instead. We may have actually not discovered this issue if a new patch came out ... lol. Edited by Sensuki, 07 March 2015 - 12:37 AM. I hope that Obsidian brings back the assets for modders. I was looking forward to extensive combat rebalance mods to change up the game on a new playthrough (not to say that the current balance is bad). Edited by Nixl, 07 March 2015 - 05:20 AM. Open source would have meant building a game engine from scratch, which probably would have nixed out of the box linux capability as well as leading to a significantly smaller game. Smaller game means smaller fanbase, which generally means less modding. So while I support the sentiment, I don't think insisting on open source would really be all that good of an idea. Edited by anameforobsidian, 07 March 2015 - 05:31 AM. I agree entirely with the reasons for externalized resources. I hope something is done about it, as I was also planning to do some modding once the game is released. I am sure OE has their reasons though, but if this is just a side-effect of some optimization, then hopefully it will be possible to reroll with to much effort on their part. Edited by Polanski, 07 March 2015 - 06:01 AM. While Pillars of Eternity doesn’t have the funding – or the underlying tech – to support modding the way some other games do, Obsidian will do what it can. “It’s kind of hard because we’re using Unity as our engine, which means there are certain things we can’t give the modders access to,” director Josh Sawyer told GameWatcher. “But we know there are already backer beta players on our forums making mods, which is great. If they want to change balance or flip around the UI screen, why would we have any problem with that? “As long as we can support it, which is not always easy on a Kickstarter budget and a middleware engine, we will. I’m hopeful that not only will people make some great mods for Pillars, we’ll also be able to open up the game more for modding down the line. What Adam said in the stream sounded positive, looks like it was unintended. OE i think you guys will revert the change but I'll add to the thread asking for them to revert that change so modding can be done as quickly and inclusively as possible. Thanks! The files are there - we cleaned up the asset bundles for memory optimizations so the game would run without crashing because it's out of memory (this is pretty important). Look at the common_vfx, common_audio asset bundles. You will find the audio and texture files that were removed from Zealous Focus in both those asset bundles. Please don't jump to conclusions so quickly and make assumptions! We aren't trying to sabotage anything or have crazy agendas. Incline is our top priority - all of the time. If you want to see how awesome the programming team is, I'll show you a little something. I'm looking at the asset bundle build size from the first backer beta to the latest one (hopefully shipping soon). In 301 it was at 3.79GB, and now it's down to 1.06GB in the current build 481. We do a lot of things that go unnoticed in the final product. Thanks for the reply Adam. Sorry about applying the heavy hand, we did not mean to imply that there was any agenda other than to optimize the game. The memory optimization has been really good. I haven't seen my game go over 1.9GB used so far in v435. Edited by Sensuki, 09 March 2015 - 11:58 PM. That's odd. my Pillar of Eternity steam folder is 3.3GB. It doesn't seem to match sensuki's 1.9GB. That's memory usage - RAM. Not the amount of storage it takes on your HD. Edited by Ark Evensong, 10 March 2015 - 01:38 PM.